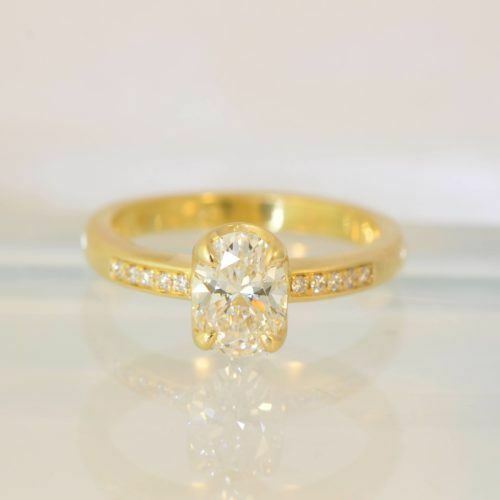 18 karat yellow gold solitaire diamond engagement ring. The ring features a round brilliant cut diamond weighing 0.46 carats. The diamond is accompanied by a diamond grading report from the American Gem Society, report 1040088564003. The diamond is stated to be H in color, VS22 in clarity with Ideal Cut, Polish and Symmetry. The diamond has No Fluorescence and is hand selected by Von Bargen’s to meet their superior light performance and proportion standards. The diamond is set with 6 claw prongs inside a hexagon shaped rim. The shank of the ring is slender. The entire ring is finished with a matte patina. The ring setting is designed and created by Rebecca Overmann, style number R14019.